100 Answers in 100 Days: Can a Fetus Feel Pain? Does It Make a Difference? 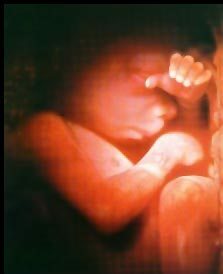 Can a Fetus Feel Pain? Does It Make a Difference? I read an article yesterday titled “Fetal pain is a lie: How phony science took over the abortion debate.” And as you can imagine, it explains somewhat that a fetus cannot feel pain. And as a pro-lifer I thought to myself, “Even if that’s true... so what?” Is it ok to kill a person if they can’t feel it? We can do that outside the womb! And we can do it to adults too. Is the fact that the fetus can feel pain really the issue? Obviously, at some point between conception and birth, the child in utero begins to feel pain. All this article is actually saying is that a fetus begins to feel pain at 24 weeks rather than 20, as was previously believed. This means that any ban on abortion after 20 weeks based on the premise that a fetus can feel pain should at least be pushed back to 24 weeks. For every argument the article makes about how “detrimental” the false belief of a 20 week limit is, you gotta ask yourself... if we shift it to 24 weeks are we really in a totally different place now? It makes no real difference. But here’s what happens... pro-lifers want abortion banned altogether (pretty much), but such things rarely happen fully in an instant. So we work towards that little by little, and we’ll go for an excuse to ban it after 20 weeks; namely that the fetus can then feel pain, because that’s better than nothing. The problem now is that articles like this can make like “feeling pain” is the sole basis for sparing the life of a child in-utero. No; we spare the life of a fetus because it’s an innocent human life. We want to spare that unborn life essentially on the same basis that we spare the life of any person outside of the womb. If you read the article, it’s spun this way... that mothers considering abortion go through great emotional anguish over the decision, and that false science (a four week gap, remember), is unnecessarily adding to their distress. And it makes people like me out to be the bad guy, as though I have no compassion for what these women are going through. Now, I’m no medical professional, but surely if a woman was concerned about the fetus’ pain, anaesthetic can solve that problem? To me, it seems like the mother is really just looking for reasons not to abort. And so they should. I get that they’re emotionally distressed over the decision, but so you would expect from someone who is intending to take a helpless, innocent life! As much as we are told that the fetus is “not yet a person” or “cannot feel pain” or “is just a lump of cells”, (phrases so often argued by pro-abortionists), you cannot escape the truth. This phenomenon of emotional distress felt by mothers considering abortion is called guilt. But I’m not insensitive to it. You have to make a distinction. I knew a girl who felt no significant distress (or at least that she would show), and she’d had three abortions by the age of 18. She had probably been successful in dehumanizing the baby in her own mind so that it was “just a product of conception.” Others who do feel emotional stress may still be selfish in their decision... “It’s terribly sad, I know, but I just can’t abandon my career right now.” And then there’s those rare cases where the baby is probably not going to live for very long outside the womb anyway. Of course this is a cause for distress... just as making the decision to terminate life support for your husband lying in a coma would be a cause for distress. It’s a similar situation, your womb essentially being “life support” for the child. These are serious moral dilemmas involving human life... there ought to be emotional distress! But the fact that there’s emotional distress over the decision doesn’t provide an answer to what the right decision ought to be. Doing whatever it takes to alleviate the distress by dehumanizing the child is clearly not the answer. Feel distressed... you’re supposed to! I can’t help thinking that it’s really science that has created this distress by giving women the option to abort in the first place! You really want the distress to go away? Then ban abortion altogether! Then the only distress that remains is over children that die naturally, just as it’s always been since Adam and Eve. God has given us this incredible privilege, and we’re very lucky to live in a time when we’re actually able to peer inside the womb and observe the development from an embryo to a baby! What expecting couple isn’t filled with excitement and joy to go and watch the ultrasound? It’s an amazing privilege. And as a Christian I watch in-utero footage, and I learn what we now know about the reproductive system, and I stand in awe at God’s workmanship! Glory to God! But we have taken this privilege and abused it. In times past, if a woman didn’t want her baby, she would have to wait until it was born and then, if she had managed to numb her conscience enough to do it, physically go and discard it in the woods or drown it. But now we’re quibbling over whether we can do much the same 20 weeks after conception, or can we extend that to 24!? It’s kind of nuts if you ask me.